His latest title, The Magician's Secret, is Hyman's third. Illustrated by Joe Bluhm, it's a paean to the power of imagination — the story of a young boy who is enchanted by his grandfather's stories which transport him though history. 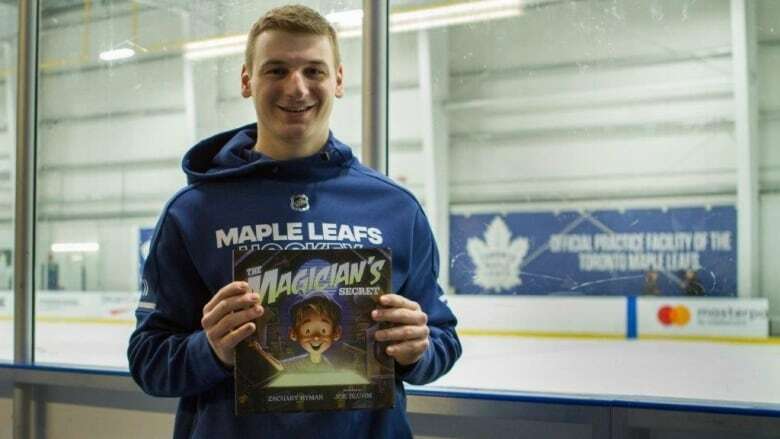 Away from the ice, Hyman writes children's books. And his message is simple: "Believe and you can achieve." His latest title, The Magician's Secret, is Hyman's third. Illustrated by Joe Bluhm, it's a paean to the power of imagination — the story of a young boy who is enchanted by his grandfather's stories which transport him through history. "When you're a kid, sometimes you get told, 'Oh no, you can't do this or you can't do that.' But really the whole world is ahead of you and you can do whatever you want," Hyman said. "And that's a really important message that I think sometimes gets lost in translation for kids. But that's definitely something that I believe in and try to inspire kids [with] when I go talk to them or read the book." Hockey Hero, his first book, came out of a Grade 7 short story. He started The Bambino and Me in high school. Both were polished in the years to follow. Writing a children's book is exacting, with the author having to get the story across in a limited number of words. Hockey Hero depicts a shy young boy bullied for stuttering who — with the help of his grandfather — takes a leap of faith. The Bambino and Me is the story of a boy who gets to hear Babe Ruth's wisdom firsthand after a visit to the ballpark with his dad. Hyman, a history major at the University of Michigan, uses the baseball star's own words — "It's hard to beat a person who never gives up" — to get his message across. "My interpretation of it is take chances, because if you don't take chances, you never know what can happen," Hyman said. "And if you fall you can always pick yourself back up and swing big again. And eventually you're going to hit that home run." It's a theme that runs through his books — and likely his blossoming hockey career. The Toronto native, who is engaged to get married next June, doesn't have kids yet. But he had grandfathers with plenty of stories. His grandfather on his father's side loved to spin stories for Hyman and his four younger brothers. One day he was a baseball star, another day he was a football star. His imagination knew no boundaries. The kids believed every word and Hyman used that inspiration for The Magician's Secret. His grandfather on his mother's side, a Holocaust survivor from Romania, died when Hyman was a young boy. Hyman filled in those stories later, with the help of his mother. Hyman's message of having the whole world ahead of you may be directed at kids, but he wants adults to enjoy his books too. "It's all going to revolve around a message for kids," he said. "Something that when a kid picks up a book and they read it, it's not just fluff. At the end of the day they can take something away from it. I think that's important and I think parents appreciate that too." "They love it. And I've actually given them a copy of each book." he said. "They keep asking for more .. It's a good gift for their family members."